As mentioned in my first post about Katherine’s wedding cake, Theresa and I are testing red velvet cake recipes in order to find the best one. Katherine’s cake will, of course, be purple, but all that really requires is changing the colour of the dye. The first recipe wasn’t quite what we were looking for, so we picked out another one to try. I was quite happy with how the colour turned out. I think the AmeriColor Electric Purple dye created more of a plum colour, rather than the blue-purple that I got using Wilton Violet. I did find that depending on the lighting the cake did still look red-ish, however. The cake itself was wonderfully moist, but didn’t quite have a red velvet texture to me. I also found that the cupcakes caved in a little bit on the top. I’m not sure this is the right recipe for us, but it’s definitely a great one to have in your back pocket! 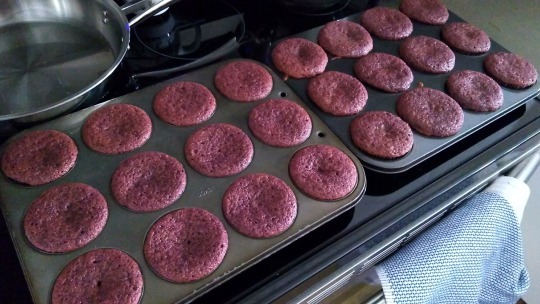 I used this recipe from D*lish, and subbed the red food dye for ½ tsp of my electric purple.